Filtered smokeless ashtrays including CEO smokeless ashtray, Dome smokeless ashtray, Smoke Grabber smokeless ashtray, Cleo smokeless ashtray, Helmet smokeless ashtray, Oscar smokeless ashtray and filters. This unique large capacity smokeless ashtray senses the presence of a cigarette(s) and automatically turns on. Quiet motor draws smoke into the super absorbent activated carbon filter, removing cigarette smoke, secondhand smoke and odor. This is the perfect smoking accessory to hold a lot of cigarette butts. The easy clean Bakelite ashtray insert is heat resistant and dishwasher safe. Comes in a wood grain finish and uses two "C" batteries (not included). Attractive, practical design is perfect for office, home and countertop. Powerful fan captures cigarette smoke allowing the activated carbon filter to absorb heavy cigarette odors near the source before they spread out and become secondhand smoke in your room. Simply raise the lid to turn it on. 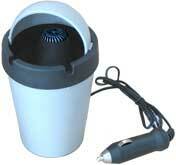 Close lid when not in use to trap smoke and odors and hide unsightly ashes. Tray is removable, dishwasher safe. Comes in white and uses two "D" batteries (not included). Reduce the harmful effects of second hand smoke! For cigarettes and small cigars. Change the cover color to fit your mood or your decoration. This unique large capacity smokeless ashtray comes in two interchangable pastel color covers. Quiet motor draws smoke into the super absorbent activated carbon filters, removing cigarette smoke, secondhand smoke and odor. The easy clean Bakelite ashtray insert is heat resistant and dishwasher safe. comes in black with tow covers in pastel green & blueish violet and uses two "C" batteries (not included). This is a perfect smokeless ashtray for use in cars & autos since it fits comfortably in a cup holder. Quiet motor draws smoke into the super absorbent activated carbon filter, removing cigarette smoke, secondhand smoke and odor from your car or cabin. 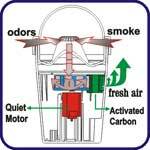 Smoke is drawn into the filter at the top and clean air emerges from the back. On and Off swith located in the back. This sports theme smokeless ashtray has a quiet motor which draws smoke into the super absorbent activated carbon filter and removes cigarette smoke, secondhand smoke and odor. Lift visor to activate motor. This is the perfect smoking accessory for sports enthusiasts. The easy clean Bakelite ashtray insert is heat resistant and dishwasher safe. Comes in a glossy white finish with a red stripe and uses two "AA" batteries (not included). This smiling Keiko smokeless ashtray has a quiet motor which draws smoke into the super absorbent activated carbon filter, removing cigarette smoke, secondhand smoke and odor. Lift mouth to trigger automatic "ON" feature. This is the perfect smoking accessory for Keiko lovers. Give it to any whale or nature enthusiast as a gift. The easy clean Bakelite ashtray insert is heat resistant and dishwasher safe. Comes in a glossy black top and white belly and uses two "AA" batteries (not included). Get the original.